As I completed 30 bodyweight BS in :55 I increased weight to 150#. Whilst I didn’t rack the bar, I did occasionally rest and shake out my legs. Dammit. It took me 1:07 to complete. I’ll have to decide if I want to increase weight or decrease time next week. I completed sets of 10 reps @ 18, 22, & 26″, focusing on speed and explosiveness. All sets were completed in unbroken reps with rebound. I put half of my bodyweight on prowler, i.e., 70#. As the weight of the prowler is 65# I pushed almost my bodyweight. How far? One hundred meters, 50m up and back. I like prowler pushes, but they ain’t easy. I completed in 1:07, with a strong push at the finish. 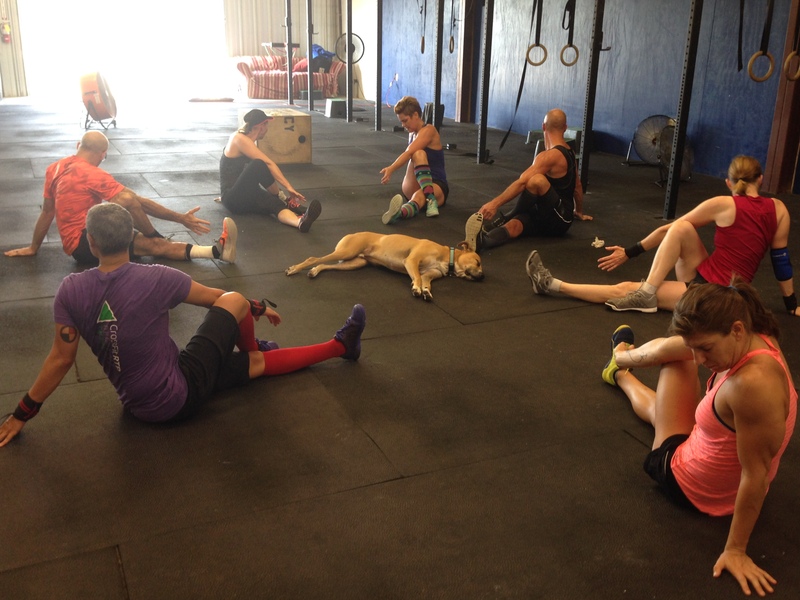 It was a fun day at CrossFit Surmount, and many of the endurance athletes achieved PRs on 800m, 400m, and 200m runs. Not only is July 22 Coach Jen’s birthday, but she led the 9:30 session! I programmed a workout from the main site, and it was fun. I completed walking lunges, pull-ups, and box jumps in unbroken reps. Yup, 50 unbroken box jumps. It’s all about the ‘bound. The rebound, that is. I completed ring dips in reps of 10, 9, & 6, knees to elbows in reps of 10, 6 & 4, KB swings in reps of 15, 9, & 6, GHD (yes, GHD) sit-ups in reps of 15, 9, & 6, HSCs in reps of 10, 6, & 4, GHD (yes, GHD) back extensions in reps of 10, 9, & 6, wall ball shots in reps of 15, 9, & 6, and then finished with 3 rope climbs. As always, Luke was by my side. I was delighted that the song “Out Here On My Own” began to play. I was kind enough to serenade Wendy, Heather S., and Carin. I know that they very much appreciated it. Luke likes to join us for the cool down.